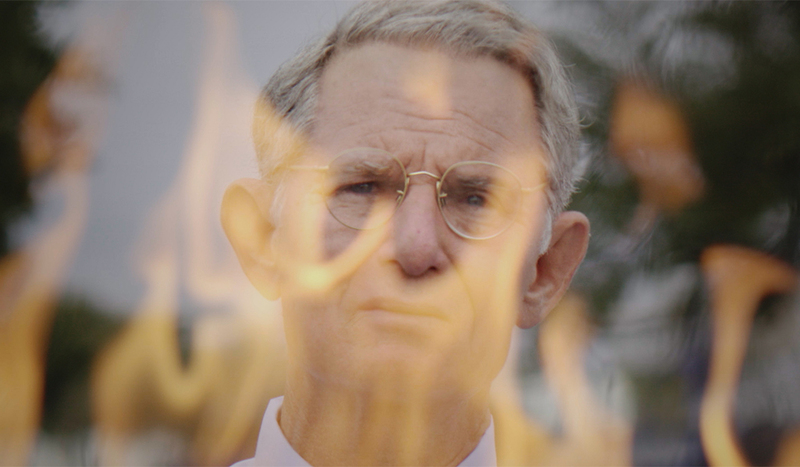 The story of the archival footage in Apollo 11 is only the tip of the iceberg — this restorative documentary had plenty of tricks up its sleeve. It’s no surprise that there are several impressive stories behind the actual story of Todd Douglas Miller’s latest, Apollo 11, which leapt out of the IMAX gate earlier this month and has now made its way into wider theatrical release (where it’s maintaining a scorching 100% at Rotten Tomatoes). 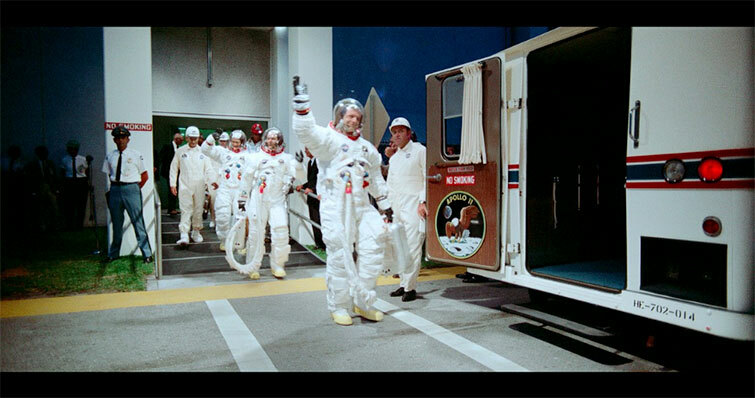 The film is overwhelmingly beautiful, assembled entirely from archival footage, some of it sourced from 165 never-before-seen reels of 70mm Panavision film covering Apollo missions 8-13. And those reels were scanned on a prototype scanner capable of 8K resolution that moves the archival film on a cushion of air without ever touching it. And who wouldn’t cut a complete, nine-day edit of the mission to create an accurate timeline from which to cull a 90-minute feature documentary? The documentary (in addition to its impressive technical achievements), is a study in discovery, timing, and connections from the past — and the NASA hobbyists and superfans who had a part in bringing it all together. What’s not to love? And that’s when the rabbit hole opened up. As Vanity Fair reported, Dan Rooney — the supervisory archivist for the NARA (National Archives and Records Administration) Motion Picture, Sound, and Video branch — informed Miller that of the 165 unexplored reels, 61 pertained directly to Apollo 11. And about that 70mm film? It was printed using Todd-AO process — a process that contact-printed 65mm negatives onto 70mm positives (originally designed to leave space on the film for a six-channel soundtrack). 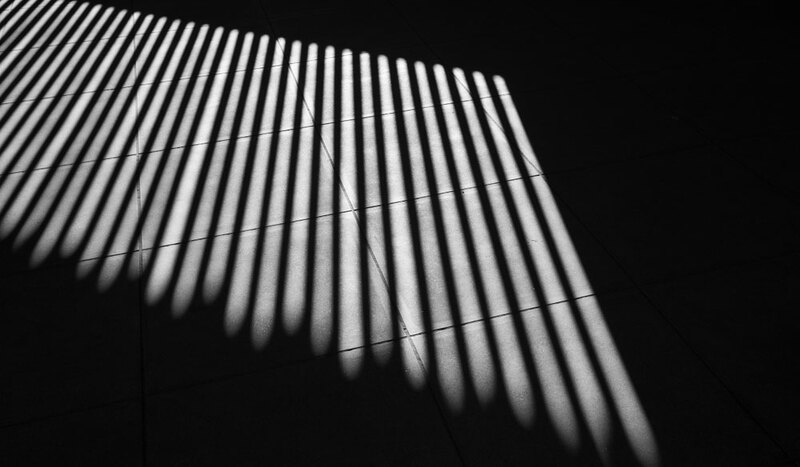 Also called 65/70, the Todd-AO process would later see use in Super Panavision 70, Ultra Panavision 70, and IMAX. The Todd-AO process was pretty hip in the ‘50s and ‘60s for grand, cinematic projects, but by the time Miller and Rooney were corresponding about the Apollo footage, NARA didn’t have the vintage projectors necessary to screen this footage and do anything with it. A couple of years before the Apollo 11 mission, NASA had put together a deal with MGM Studios and the filmmaker Francis Thompson, a pioneer in producing proto-Imax giant-screen documentaries, to make a picture that would tell the story of the entire Apollo program. But Thompson backed out only a few weeks before the Apollo 11 launch. So NASA struck a new deal with Thompson’s editor, Theo Kamecke, for what would ultimately become Moonwalk One (which The New York Times describes as “a strange combination of educational documentary and blissed-out philosophizing that opened in New York at the Whitney Museum in 1972.”). Surprise: it flopped, but that’s how we ended up with all those NASA reels in Todd-AO — much of it was simply left over, but some of it NASA shot for promotional/PR reasons. Though, as Kamp points out, there’s no one still alive at NASA who can say why. 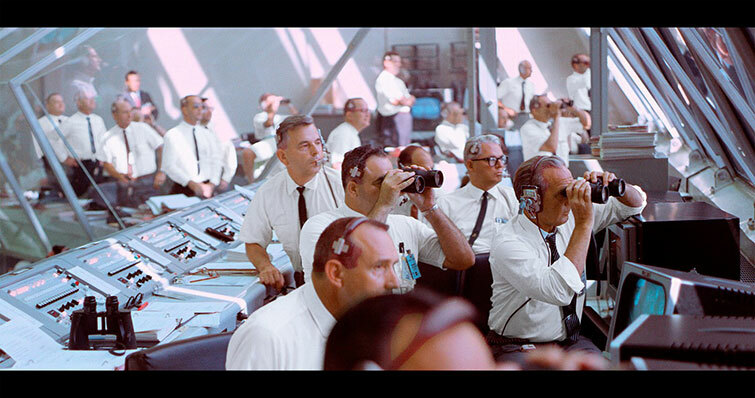 So Miller’s Apollo 11 post-production shop rigged up the custom scanner operation, and, finally, someone could watch the reels. But the audio surprises don’t end there. 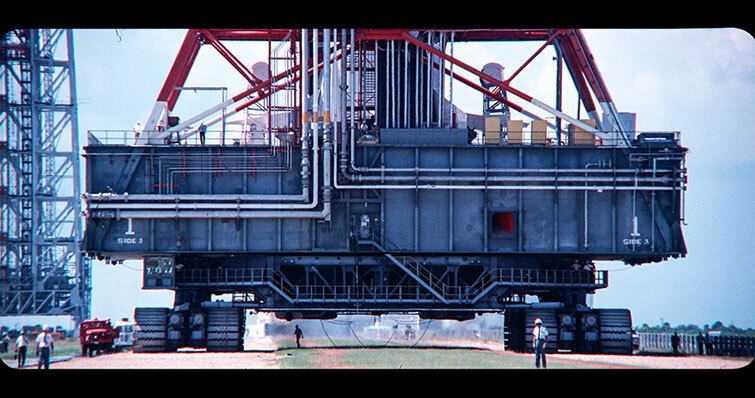 As Ben Kenigsberg details for The New York Times, a fair deal of the 70mm footage in the documentary includes close-ups of the launch captured primarily for engineering purposes. It’s one of the film’s greatest strengths — seeing just how long it takes a Saturn V engine nozzle to fully pan up the screen, or just how much ice falls away during liftoff to shatter on the launch pad. But this footage was also silent. 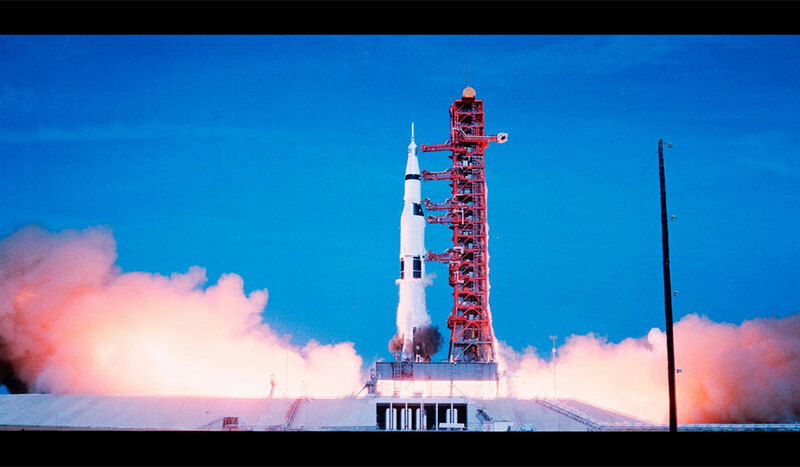 Fortunately, a team at the University of Texas at Dallas had just completed a years-long project to digitize over 10,000 hours of NASA audio recordings for the Apollo 11 mission across 60 channels. This audio included back-room loops and mission control chatter that not only detailed every passing moment of the mission, it also captured a few very human conversations — one or two of which appear notably in the film. These 10,000 hours were nigh unusable. Enter yet another passionate hobbyist doing the aeronautics and aviation worlds a solid — Ben Feist. Feist has a day job as a tech lead in Toronto, but in his spare time, he creates amazing passion projects like Apollo17.org, which aggregates “publicly available audio, transcripts, and moving and still images into an immersive ‘real-time mission experience’ of humankind’s most recent trip to the moon” (Kamp). So Feist wrote a program to turn all that unusable Apollo mission audio into usable material. In another stroke of good fortune for Miller, this meant that the public relations officers calling the event for the bandstands would serve as real-time narrators throughout the film, translating NASAese into something intelligible, and sparing Miller and his team from an inelegant voiceover track. According to Miller, “They’re amazingly witty, they dumb it down for people that don’t want all the math that goes on, and we could kind of choose when to highlight that” (Space.com). But there’s a final, fortuitous stroke in the Apollo 11 audio saga. NASA sent each astronaut with a cassette recorder for mission notes, but, in a classy move, NASA also made Aldrin, Armstrong, and Collins mixtapes for the long journey — tailored to each astronaut’s taste with fresh tracks supplied by music industry connections. All of the restorative audio work led to another discovery. On the night before the moon landing, Aldrin played John Stewart’s “Mother Country” on his cassette player, a folksy bit of Americana that served (then) as an appropriate ode the mission and (now) as a soundtrack to the documentary’s careful gravitas. No one had heard or seen this bit before, and when Miller and his team approached Stewart’s widow about featuring this scene and her late husband’s song in the documentary, she readily agreed because . . .
She and her husband were friends with some Project Mercury astronauts in the ‘60s. Moral of the story? Always nail your audio, whatever it takes. All images via Statement Pictures. Looking for more on filmmaking and video production? Check out these articles.